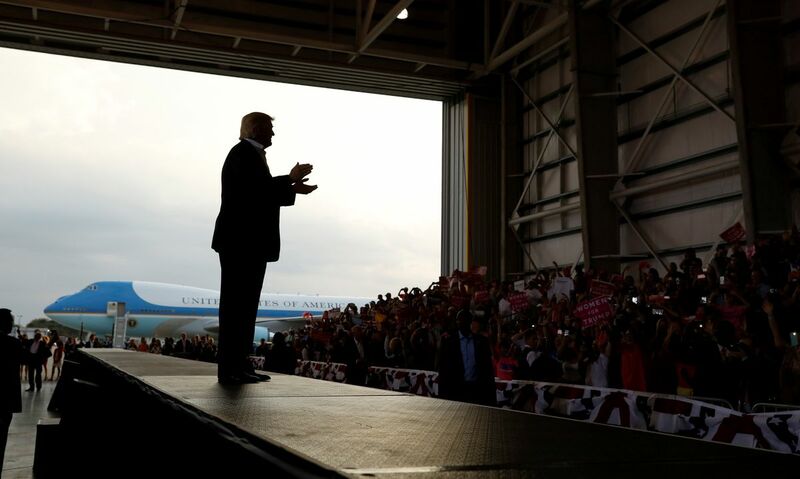 On Saturday, President Donald Trump traveled to an aircraft hanger in Melbourne, Florida, to give a campaign speech to a crowd of cheering supporters. It was not a pleasant speech for libertarian Trump fanboys, who hold the view that Trump is about to disband NATO and end foreign military adventures of the United States.When he got to outlining his views with regard to the state and the molding of culture, his comments became even more horrifying. What I want to do is build safe zones in Syria and other places. I've also directed the defense community headed by General, now — you know, he said it, he said it — and now Secretary ‘Mad Dog’ Mattis, to develop a plan to totally destroy ISIS. I have ordered the department of defense to begin plans for the great rebuilding of the united states military. We've directed the creation of a task force for reducing violent crime in America, including our inner cities. We're going to make our inner cities safe again...Safety is a civil right. And we will fight to make America totally safe again. I've ordered the Department of Homeland Security and the Department of Justice to coordinate on a plan to destroy transnational criminal cartels which are all over the United States and we are going to stop the drugs from pours into your country, into your community, into your cities and poisoning our youth. We're stopping it. We're stopping it. The nation state remains the best model for human happiness. Trump did not indicate in his speech how he plans to use the state to mold the nation into a specific economic, social and cultural style. This is not libertarianism. This is authoritarianism. They are the words of a power freak, who wants to mold the country in his image. The melding of the NFL and the U.S. military over the past fifteen years is a prime example of the direction that Donald Trump wants to thrust this former republic, in order to a achieve a 21st century Sparta. If you listen to even a smattering of TV or radio it is nearly impossible to go more than a few minutes before you hear some commercial enterprise praising the men and women of the U.S. military. Every child under the age of 16 has grown up listening, and seeing the men and women of the U.S. military being relentlessly epitomized as the nations finest human beings. Sadly, yet another generation of Americans now view paid mercenaries who practice their murderous arts out of sight of the general public as the sanctified saviors of individual liberty. I can only imagine what my algorithmic fealty score is at this point. As opposed to every other president that came before him. Libertardians and their lack of perspective belong in a museum. Ofcourse nation state is better than a supranational global state. Nation state is worse than micro states, which are worse than no states. But libertardians can't see the point can they? If, as in this case, the nation state has military projects world-wide that doesn't make it much better than a supranational global state. "The nation state remains the best model for human happiness." Scary, but Obama/Bush etc thought the same with a more globalist worldview which is just as scary if not more so. It's all authoritarianism and there should be no support of it from libertarians. I haven't heard much from Libertarians for Trump recently. Are there active Libertarian fanboys other than Justin Raimondo? Peace with Russia, tax cuts, school vouchers, abolition of obamacare, deregulation, expulsion of the 20m illegals, inquiry into vaccines, ridicules PC behavior, ban on the mussies...McCain, Pelosi and CNN hate him. Its all good.